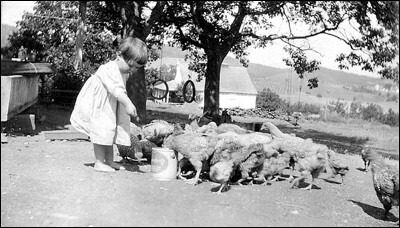 My mother Fredene Ama Daugherty feeding the chickens at Edgevale in 1922. My mother's parents managed the orchard and farm at Edgevale until they built their own farm house on Kings Highway in the 1930s. Edgevale is outside of Phoenix, Oregon on the edge of Carpenter Hill. Most of the original buildings are still there, including both the main house and the manager's house as well as nearby Independence School. Today Edgevale is the home of Edgevale Vineyards.